A Grape Vine Grows in Manhattan –150 bottles from one rooftop. 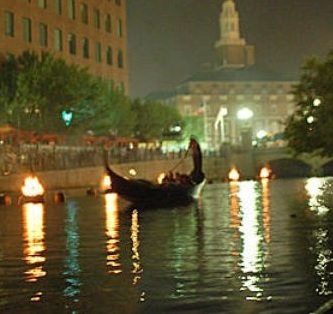 This delightful story appeared 2011 at the Treehugger.com website. 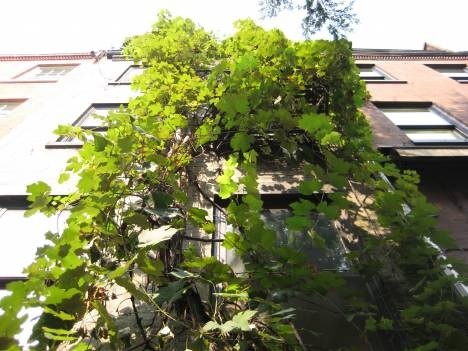 A Niagara grape vine was planted in the tiny backyard of an apartment building in Manhattan, in 1977. It then grew up 4 floors and now covers a trellis on the rooftop. The owner is an engineering professor, who was inspired by his father, an amateur winemaker back in Basra, Iraq, where the owner was born. NEW YORK — Latif Jiji stood on his Manhattan bedroom balcony and leaned out into a great, green vine. Facing the gray buildings of midtown, he grasped a handful of grapes and snipped, leaned farther, grasped another, snipped again, until he had filled two plastic bags with the fruit of his bedroom view. Jiji, an engineering professor originally from Iraq, has made his townhouse into a vertical winery. Jiji left his country in 1947 to study in Michigan. Political cataclysms shook the Middle East in his absence, and he never went back. Much of his past was lost. But he could share with his wife, Vera, and their four children his family tradition of winemaking. Back in Basra, his father had made red wine. [Jiji] coaxed a vine he planted in 1977 to grow up four stories along the back of his home and cover almost all the roof — more than 100 feet of gnarled wood and green grapes. He built his own air-conditioned wine cellar and stored 20 of his vintages in the basement. And each year he manages the picking of hundreds of pounds of grapes and sets up a crushing, pressing and chemistry operation outside in his narrow back yard. Jiji’s vine has also been put to multiple uses. He used to keep the grape leaves and his mother would stuff them with meat and rice. Each year, there is grape juice. Jiji has also sent the seeds and skins left over from winemaking to an Armenian friend, outside the city, who uses a still to ramp up the alcohol content and make something entirely different. [Jiji] came to this country in 1950 to study at the Massachusetts Institute of Technology … a professor since 1954, came to CCNY after teaching at New York University. He also identifies with many of his CCNY students because he was the first in his family to go to college and because he was forced …to give up his Iranian citizenship – by order of that country’s government.